Christmas is just a few days away and I am ready. Besides the yummy food and treats I will consume, I get to hang with the family and enjoy the present opening that seems to last all day in this house (we take our time and try to stretch it out as long as possible). With the holidays in mind I am sharing a few of my favorite holiday internet findings this week. Christmas Cards - A dad who knows how to navigate photoshop started doing Christmas cards using his kids when his boy was in diapers. It snowballed into this and he has declared that his parents hate him and his kids will hate him more. I, however love them! Click through to see all 8. Gingerbread Houses - These gingerbread houses are pretty amazing and obviously done by people who have way more talent than I do. Pretty cool though. Christmas List - Give this list a little read. Just a really nice wish list for the season. 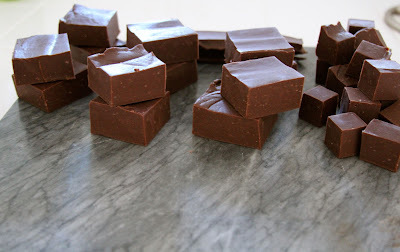 Fudge - I made my second batch of this and it is going fast. Pretty sure number 3 is right around the corner. It's so easy to do I have no idea why you haven't done it yet. Enjoy your weekend and avoid the malls if at all possible!